Kamezi Villas Free Child Places Playa Blanca, Lanzarote The 4 star Kamezi Villas is set in a quiet peaceful area, but not far from the beach These unique white washed villas offer home from home comforts under the sun. The Villas Kamezi is a fantastic choice for couples, families and groups of friends. Each elegant villa boasts open-plan living with modern facilities and its own private pool. Ideal for those looking for a relaxed and quiet holiday. Comprising of two, three and four bed villas and great of on-site facilities including reception area, this complex provides everything you will need for a relaxing holiday in the sun. Claim your Free Child Place Now at Kamezi Villas. 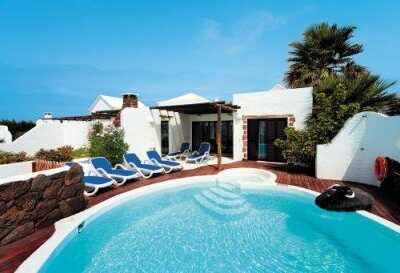 Located approx 400m to the nearest shingle beach and approx 5km to the main resort of Playa Blanca. The villas feature a good size kitchen, complete bathroom(s), bedroom(s) living/dining area, TV, private pool, sun deck, loungers and barbecue facilities. 2 bedroom Villas sleep up to 4 and four bedroom villas sleep up to 8.